QC Design School is a faculty of QC Career School, an online international school that has been educating creative professionals through distance education since 1984. QC’s design courses are committed to giving students the best design training possible from the comfort of home. Receive a fully comprehensive, classroom-like education from anywhere, thanks to online training. 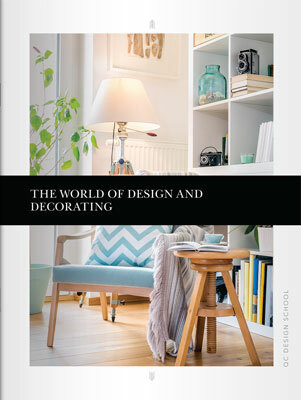 You’ll learn home design by studying lesson texts and watching video tutorials. Work through hands-on assignments entirely at your own pace, with virtually no deadlines. Through personalized feedback from practicing design professionals, QC Design School will provide you with the skills necessary to build a successful home design career. Whether you have questions about enrolling or you need help with your assignments, QC’s outstanding Student Support Specialists are readily available to assist you. The support team is available by email, phone, or Live Chat. Students and graduates can contact Student Support for questions or advice at any time regarding QC’s design courses. QC Design School ensures that all of your educational needs are met, and provides you with career advice both before and after you’ve completed your online home design classes. QC Design School has the highest possible consumer satisfaction rating (A+) with the Better Business Bureau (BBB). Thousands of QC graduates have started lucrative careers in the design industry since 1984. QC’s online design training is flexible, affordable, and prepares you for success as a designer. Graduates receive a professional design certification to show that they completed QC Design School’s comprehensive online home design training. View QC Design School’s Better Business Bureau profile. At QC Design School, providing high quality online design courses is the highest priority. With QC’s 100% money-back guarantee, you’ll have 21 days to review your course materials from the day you receive them. If you have any questions or concerns, contact us. If you find, for any reason, that QC’s online design course is not right for you, you’ll receive a full refund. Simply return the course materials (unused, with a tracking number) and your course fees will be immediately refunded. All you need to do is call QC Design School for shipping instructions. For more information about your enrollment in QC’s online design courses, contact the school via phone, email or Live Chat. QC Design School’s mission is to provide you with the richest and most personalized learning experience for your online design training. You’ll receive complete design career training in the comfort of your home, with full support from QC’s Student Support team and your personal tutor. QC Design School offers the highest quality of home design classes and student support services available! You’ll see quality in every aspect of your design courses, from textbooks to instructional videos and even additional art supplies. QC’s team of top design industry professionals provide you with up-to-date information on modern home design trends. QC is continuously improving your online learning experience. QC Design School’s Student Support Specialists are available to answer all your questions about the online design courses. You’ll be provided with unmatched advice and guidance before, during and after you graduate. QC consistently strives to develop and continue personal relationships with each student and graduate. Educational support is constant during your online design classes and after you become a certified design professional. From the first point of contact to after graduation, QC’s goal is to ensure the communication between the school and its students is helpful and memorable. You’ll have an exceptional learning experience on the way to launching your professional home design career! If you’re ready to take the first step to a new design career, enroll today!